The design firms crafting innovative, visually stunning, historically respectful and sustainability strategic office spaces in Seattle are multitasking wizards, able to get into the mindset of a company’s distinct needs, while also representing the company’s brand in the subtle aesthetic of the interior and exterior design. This list below highlights varied firms, some with a wide range of project experience that reaches beyond office spaces, as well as more boutique firms growing their presence in Seattle’s commercial architecture field. Many of them share an impressive willingness to tackle challenging, historic renovations, as well as discover creative solutions for offices that require a unique combination of placement strategy, visual beauty, and layout flow. BjarkoSerra Architects was founded in 1992 and has grown their distinguished status in Seattle’s design scene ever since, with varied project types including office spaces. Their completed projects, not limited to office spaces, have been featured in The New York Times, Luxe, Arcade, Dwell, Seattle Homes and Lifestyles, Seattle Magazine/Northwest Home and Garden, Pacific Northwest and Seattle Metropolitan. Founders Greg Bjarko and Chris Serra met as architecture students in Bozeman, Montana, and ended up blending their expertise after gaining experience with other firms. BjarkoSerra has been honored with the AIA Honor Award commendation and the AIA Home of the Month designation. Though their presence in office design is just now growing, their notable reputation and widespread achievement makes them stand out. BjarkoSerra worked in close collaboration with the core team of designers at FiftyThree — a company that creates graphic application software and tools — to carefully fold their vision and brand into a large loft in one of Pioneer Square’s historic buildings. Exposed brick walls and wood paneled ceilings, exposed wood columns, well-placed can lighting, and white locker desks make the office feel all at once rustic and urban. The development included 4,800 square feet of office space, two conference rooms, a group design review area, a kitchen and dining area, a shop space, and two standalone work rooms. Workshop AD, founded by AIA member and LEED-certified architect Steve Bull, dedicates itself to a practice that can adapt to urban and rural design needs while expressing the human experience of place. Bull has led his team to work on projects throughout the Pacific Northwest, Alaska, and the Intermountain West. His work has been recognized with AIA State and Regional awards, and he previously received the Rotch Traveling Scholarship, which took him to South America to document historic and modern adaptations of architecture to landscape. Bull received his Master of Architecture and his Bachelor of Science in Art and Design from the Massachusetts Institute of Technology. He serves as an adjunct professor at Washington State University. The firm has been the recipient of the Pacific Northwest AIA Merit Award, the AIA Award Honor Award for Washington Architecture, and the Future Shack Award Program, among others. Workshop AD’s work on the Interurban Building, which is nestled in the Pioneer Square National Historic District, required careful collaboration with engineering consultants to ensure that successful space modifications could be made to allow heightened efficiency and a more open feeling. The original masonry and wood-framed edifice was constructed in 1894 and had a lot of potential remaining in its historic charm. Workshop AD envisions the 36k-square-feet structure to include new mezzanine stairways, entertainment venues, retail and office space. The Reedo Building, a turn-of-the-century, three-story brick warehouse that was damaged in the Nisqually 2001 earthquake, required restoration, renovation, and repair, including the addition of a lofted fourth floor. Two mezzanines are linked by steel bridges, skylights invite interior natural light, and rooftop views of the Olympic Mountains are accessible from industrial windows and doors. The space was leased to the offices of a coffee company in 2007 and demonstrates Workshop AD’s strong renovation vision for historic structures. Best Practice was founded in 2011, and they dedicate themselves to providing unique solutions that balance function, content, and beauty. They are accustomed to working on diverse projects, including residential, office, restaurant, and cultural. Their small team is led by AIA member Ian Butcher, who received his Master of Architecture from the University of Washington and has a bachelor’s degree in environmental design from North Carolina State University. He has taught in the Interior Design department at Cornish College of the Arts and has served on the board for ARCADE Magazine. Best Practice has been recognized in Architect Magazine, Frame Magazine, WeAr, Gray Magazine and Interior Design Magazine. The 20k-square-foot office expansion and tenant improvement in the Simply Measured building highlights the firm’s knack for blending diverse needs into a functional space that rests on flow and style. Glass walls for individual working units provide transparency and interconnectedness, while bold colors and creatively placed meeting nooks cultivate an innovative, urban vibe, as well as a unique variety of workspace options. The Eye Eye Care + Clinic needed to expand their footprint to encompass new office and clinic spaces, as well as a new display and reception area. The design takes advantage of the ceiling height to craft a sense of transparent compartmentalization through open framed walkways and simple hanging light fixtures. The space creatively fuses varied geometric shapes through structure, furniture, and mural art, to generate a clean, crisp aesthetic. CollinsWoerman values a highly collaborative working environment, based in timeless, expressive, and environmentally sound design. Since 1988, when the firm was co-founded by Arlan Collins and Mark Woerman, they have been planning and designing what now reaches an estimated $1B a year in construction value, and they are adept at a range of project types, including office, healthcare, residential, and science/technology. Collins is a registered architect in Washington, Idaho, California, Utah, Massachusetts, Missouri, North Dakota, Hawaii, and British Columbia, and he received his Bachelor of Architecture from the University of Idaho. Woerman is an AIA member, as well as LEED AP BD + C certified, and he also received his Bachelor of Architecture from the University of Idaho and completed graduate studies in Arctic Engineering at the University of Alaska. CollinsWoerman owns Sustainable Living Innovations, a project delivery company reduces construction timeframes by up to 60 percent. 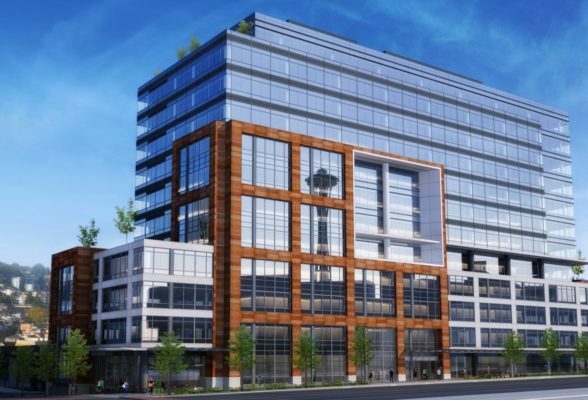 The proposed 400 Dexter building will be comprised of 11 stories for offices and office labs, including below-grade parking for roughly 350 cars. A south-facing public space will incorporate a community spirit into the 260k-square-foot edifice that is guaranteed to be LEED Silver certified. This spec project represents the growing footprint CollinsWoerman is making on larger scale, mixed-use office spaces in Seattle’s burgeoning metropolis. When designing the EMP Museum administrative office building, CollinsWoerman wanted to craft a space that would balance the functionality of form, while respecting adjacent residences and views. The 53k-square-foot, four-level result is stylistically aligned with the main EMP Museum and incorporates a stealthy balance of boldness and simplicity in the modern elements of the interior character. Shed bases their design values around the healthy integration of pragmatism and idealism. Their team is highly versatile and works on restaurants, mixed-use commercial spaces, residences, and offices. Shed has taken on projects ranging from $250k to $25M. Principal Thomas Schaer received his Master of Architecture from the University of Washington and received his undergraduate degree in business administration from Babson College. Principal Prentiss Hale also earned his Masters of Architecture from the University of Washington and has an undergraduate degree in history from Yale University. The firm’s work has been recognized in Gray Magazine, Inhabitat, 1889 Magazine, Remodelista, Curbed, the Seattle Met, Seattle Magazine and the Seattle Times, among others. The repurposing of a historical building in Seattle’s Pioneer Square created a contemporary, open office space that maintained original brick elements. The addition of cube-shaped quiet areas, hanging lightbulbs, exposed piping, and wooden ceiling beams, as well as a raw wooden interior furniture touches, imbues the space with a refined, rustic aesthetic. The Belltown Office Space tasked Shed with crafting accessibility, cost reduction and design appeal in the 21k-square-foot concrete and timber building. Shed envisioned seismic retrofit work, a simplified structural design, a basement parking level, a new elevator, and a grand rooftop deck. The interior’s original heavy timber and concrete finishes were revealed, and new core-containing bathrooms added. AIA fellow George Suyama founded Suyama Peterson Deguchi in 1971. For decades, the firm has been bringing their prowess for clean, bright, functional design to the Seattle area. In addition to office spaces, their versatility includes work on residential design, restaurants, and other commercial facilities and they pride themselves on their Northwest contemporary design aesthetic. Suyama received the AIA/Seattle Medal of Honor and is dedicated to creating an “ambience of place” through his work. Business partner Ric Peterson is also an AIA fellow and has been working with Suyama since 1978. AIA member Jay Deguchi completed graduate school at UCLA. He joined the team in 1992 and became a partner 10 years later. Some of the notable awards the firm has received include, the AIA Seattle Merit Award, the AIA Northwest & Pacific Region Honor Award, the Seattle Homes + Lifestyles Design Achievement Award in Architecture, and the Excellence in Concrete Construction Award. The user experience research and design firm known as Blink needed a new 9,000-square-foot office to house a versatile array of services, including trainings and event areas, client meeting and worker collaboration rooms, and an art gallery. The goal for Suyama Peterson Deguchi was to create function and flexibility in the multi-use space that would also allow for a growing staff. The simple, sleek interior is accentuated by the use of concrete, sharp lines, basic color palettes, and contemporary hanging light fixtures. 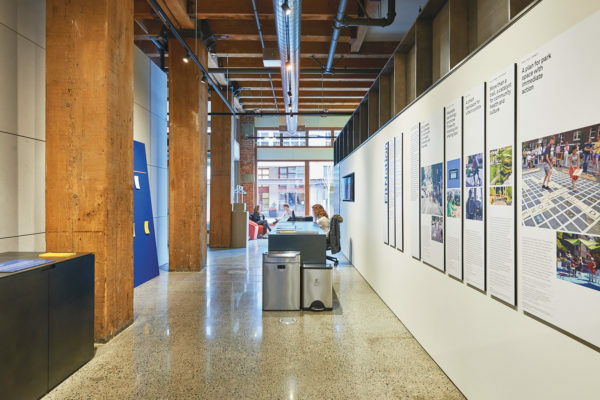 Suyama Peterson Deguchi collaborated with AIA Seattle, the Seattle Architecture Foundation, Design in Public, and the AIA Washington Council to create their new office space and home, the Center for Architecture & Design. Industrial, open, bright and airy, this space includes exposed wood ceiling beams, a mix of collaborative and private working areas, long gallery walls for exposition, and rugged, exposed brick on some of the interior. Stuart Silk Architects enjoys being boundary pushers in the field of design and sustainability. The firm is a member of the U.S. Green Building Council and supports LEED and King County’s Built Green Program. They are committed to expanding and integrating their evolving knowledge of green architecture practices. Principal and founder Stuart Silk graduated from the Yale School of Architecture and founded his firm in 1981. He has lectured at the University of California Berkeley, the University of Washington, the University of Edmonton, and at the Venice Biennale. The firm’s work has been featured in Luxe Magazine, Portrait of Seattle, the Seattle Times, the New York Times, Domus Plus, and Gray and Trends Magazine, among others. They received recognition on the Luxe Interior + Design 2017 Gold List, the 2010 Masonry Institute of WA Honor Award for Excellence in Masonry Design, and the 2012 Excellence in Masonry Design Award, and their work on a Lopez Island Cabin was voted “Home of the Year” by Seattle Homes & Lifestyles. In the admiral district of West Seattle, the Orion Building is an impressive 14k square feet of finely designed, sustainable dental/office space. An eastern glass facade invites light and characterizes the structure with sleek professionalism. Certified by the USGBC to be LEED Silver for a Core and Shell building, the project used an alternative demolition strategy for the existing edifice, which diverted 90 percent of the debris from the landfill. It also locally sourced recycled building materials and a green roof. The Orion Dental Building was recognized with the Masonry Design Honor Award for Commercial Architecture and was the winner of the NAIOP Office Development of the Year Award. The Salmon Bay Landing Office Building tasked Stuart Silk Architects with the needs of a large industrial space that also had sustainable design features and aesthetic sensibility. The result, 34.5k square feet of office space that looks out on Magnolia’s ship canal, is the winner of Overall Best Project in Metal Construction News and employs various green design features, including bicycle storage commuters, an HVAC-designed building envelope for energy efficiency, salvaged materials, and easy-to-use recycling areas. Graham Baba brings their passion for subtle and economic design to every project they take on, including restaurant, office, residential, and art spaces. The team of 24 employees has been recognized with the 2017 Architizer Award, the 2017 Chicago Athenaeum: Museum of Architecture & Design Award, the AIA Seattle Merit Award, the AIA Northwest & Pacific Region Honor Award, the AIA Central Washington Honor Award, and the AIA Central Washington Citation Award, among many others. Jim Graham and Brett Baba bring a combined 50-plus years of experience to the firm. The firm’s capacity for creative collaboration with clients, and their vision for the unique character embedded in space, makes them shine as one of Seattle’s leading giants in architecture. Graham Baba’s work on Artefact, a high tech/industrial design firm in the historic Pioneer Square district, gleams with an open floor plan, lovely wood ceilings, reclaimed wood columns, hyper-industrial lighting fixtures, and handsome wood flooring. Working in close collaboration with the vision of the team at Artefact, the space reflects the company’s desire to create interconnectedness between work flow areas. This adaptive reuse of a 1916 warehouse/toy factory takes advantage of Elliott Bay vistas and offers a commons area and a cafe and bar area, as well as a small library. The Mazlo space on Capitol Hill reflects Graham Baba’s style versatility beautifully. The office is home to a tech company focused on software that supports healthier lifestyles. It’s 2,730-square-feet on the fourth floor of a six-story, mixed-use building and uses corrugated ceilings, large glass doors, and simple color palettes to accentuate a sharp, fresh urban vibe. A balanced combination of office space and workout space brings the company’s focus on healthier lifestyles to life for its employees. Atelierjones is a design firm with multiple capabilities, having worked on reclaimed urban sites, churches, offices, homes, theaters, transit stations, sport courts, and gardens. Founded by AIA fellow Susan Jones in 2003, the firm enjoys revitalizing the overlooked value in sites and buildings, as they seek out creative new ways to implement sustainable design practice with visual innovation. The firm collaborates with various nonprofit arts organizations throughout the Pacific Northwest, including Arcade, Architects without Borders, and Suyama Space. Jones has been teaching at the University of Washington since 1991 and has been a visiting design critic at several national universities. She is LEED BD+C certified and is an affiliate associate professor of architecture in the College of Built Environments. Atelierjones has been honored with many national and local design awards, including the AIA Seattle Project of the Month, the NAIOP 2008 Innovation Project of the Year, the Faith & Form/IFRAA Awards, and the AIA Seattle Honor Awards – Honorable Mention. The sustainable consulting firm Paladino and Company hired Atelierjones to renovate their 3,220-square-foot downtown Seattle office. What became a highly collaborative design and build operation transformed the space using local, reclaimed materials. Unique accents like wooden screens attached to steel frames create a quintessential Northwest aesthetic and adds warmth to the hip new space. In the commercial hub of Madrona, Pike Station includes ground level work and retail space, as well as a hand full of dwelling units. This project focused on adhering to the Cascadia Region Green Building Council’s Living Building Challenge. The result is both bold and functional, urban and communal. Rooftop gardens provide extra green space, and energy-efficient wall and fenestration systems provide reduced heating and cooling loads. The final product is a three-story L-shaped structure with large windows that invite in plenty of natural light. Shannon and Kyle Gaffney and Brian Collins-Friedrichs founded SkB Architects in 1999 — a full-service architectural and interior design firm with a staff of 40 and a commitment to creating flexible, beautiful, and high-performance environments. Shannon Gaffney works on a large scope of projects, including mixed-use, retail, residential, office, and restaurant. Kyle Gaffney crafts structures that are cost and resource conscious. Brian Collins-Friedrichs brings over 30 years of experience to his work with an expertise at balancing creativity and technical prowess.\nSkB was a finalist for the 2017 Architizer Award and the 2016 Mixed Use Development of the Year Award. The firm also received the 2015 AIA People’s Choice Award in Urban Design 400 Fairview, the RealNetworks Seattle Local Architect National Merit Award, and the 2013 International Design Award for the Bel Henry Residence. Their work has been featured in Interior Design Magazine, Portrait of Seattle, Luminous Spec, Dwell and Simple Sanctuary. Seattle-based furniture procurement and West Elm Workspace dealer, oBJEKTS, needed a space where they could work, host and entertain clients, and showcase the range of their brands. Located in a one-story 1940’s-era building—originally a foundry—in Seattle’s rapidly evolving Belltown neighborhood, this modest, 2,000-square-foot project is a study in contrasts. Outside, the building has been painted off-white, presenting a serene, neutral exterior to the streetscape. Inside, the architects stripped the space back to its bones, exposing masonry and cast-in-place concrete walls and concrete floors, and opened up the ceiling plane to reveal the building’s wood glulam truss system. Wood from the demolition was re-used to create a display wall. Glossy black Fireclay tiles clad a rectangular volume housing office utility functions that include the kitchen, bathroom, and storage space. A conference room is slotted in behind the tiled volume and is separated from the rest of the office with sliding translucent panel garage doors. An accordion window-wall system at the rear of the building opens up the interior to the alleyway, which functions as an urban porch. Swirling murals decorate the two exterior corners of the building facing the parking lot. The end result is a contemporary, open and welcoming workspace with a nod to texture and materiality.